Did you know that according to the Clean Air Council, consumers in the United States use approximately 102.1 billion plastic bags annually? And that is just in the US, not worldwide! That is one big reason why I much prefer to use reusable grocery bags. Yet while I love using my cloth grocery bags, I do take issue with the fact that they have very little support in the bottoms, and they also do not hold very much. 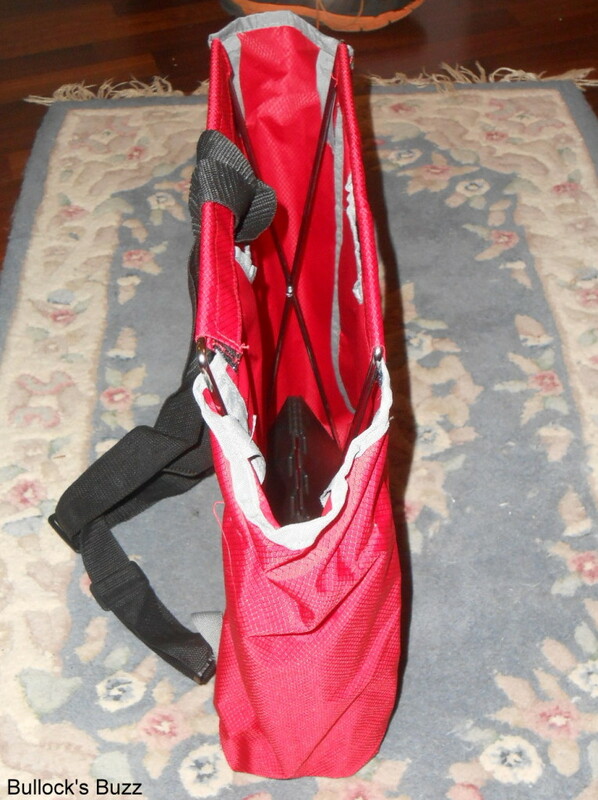 I have gone through many bags that either tear or the bottoms fall apart. So when I was offered the opportunity to review a reusable bag called The Grocer, I couldn’t wait to give it a try! 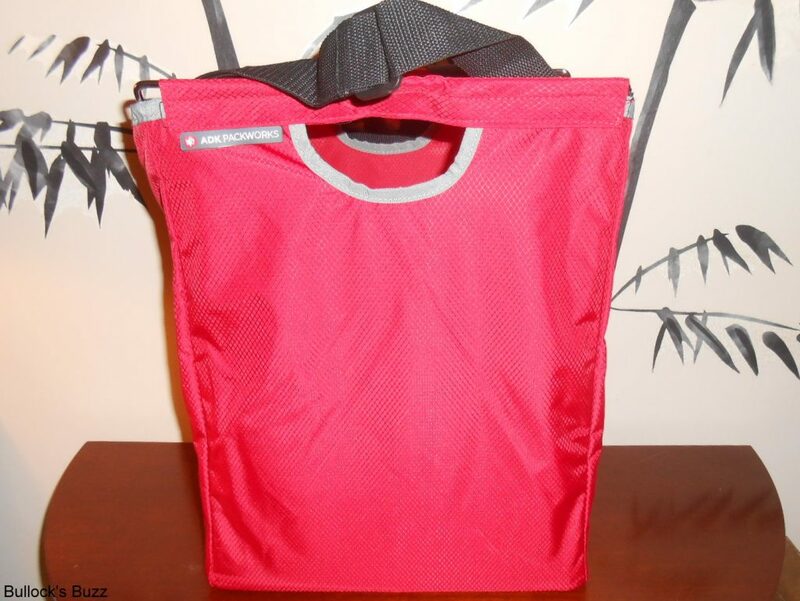 Made by ADK Packworks, The Grocer is an innovative, versatile bag quite unlike any reusable bag I have used before! 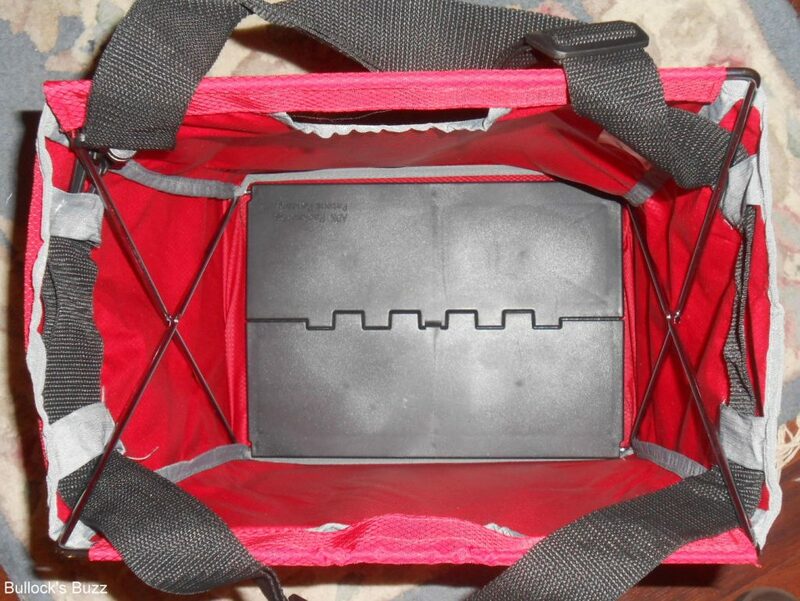 It features an internal folding metal frame and a sturdy, flat, plastic bottom which helps the bag keep its shape, prevents it from falling over and keeps the bag open for easy loading and unloading. That same frame allows you to fold the Grocer flat when not in use for easy storage. The bag itself is made of a durable ripstop nylon which can easily be removed from the frame and hand washed to remove dirt and avoid the bacteria that often builds up inside plastic-based reusable bags. When open, the Grocer measures approximately 15″ x 12″ x 8″ – which is big enough to hold quite a bit! Due to the metal frame, an empty Grocer weighs 1 lb 12 oz which is heavier than a regular tote, but the versatility more than makes up for that little bit of extra weight! 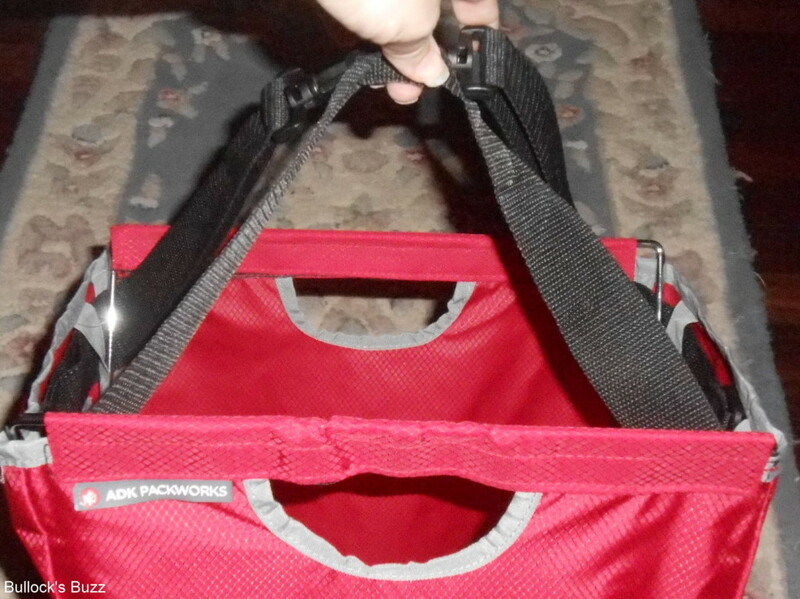 The Grocer also has a unique, adjustable and removable strap with clips on each end that allows you to carry the bag three different ways depending on how you place the strap. You can carry the bag as a two-handled tote, or adjust the strap to where it can be carried as an over-the-shoulder bag. You can also fold the strap in two, and tie it off so you can carry it as a backpack. The Grocer comes with detailed instructions showing you exactly how to use the strap for each position. At the grocery, what usually would take 3 or 4 of my other bags, fits perfectly in the Grocer, and I don’t have to worry about it falling over or spilling! The versatility of this bag allows The Grocer to go beyond being used just for grocery shopping. I have used it to carry clothes and essentials on trips, for taking picnics to the park, carrying everyday gear to work, and so much more. The Grocer comes in four colors, red, grey, cranberry and green, and retails for $25. While it is a bit pricey, you will get much more use out of it than you would with other reusable bags! Several additional accessories are also available for the Grocer including an insulated liner so you can carry foods that need to remain cold! You can learn more and purchase the Grocer directly through the ADK Packworks website. One lucky Bullock’s Buzz fan will win their own Grocer! To enter, use the Giveaway Tools form below. This giveaway is open to the US only and will end September 2 at 11:59 pm CST. We would love these. We have so many reusable bags and we always forget them at home just to bulky. It looks like we coud fit these under the front seat. I would use it when I do my heavy grocery shopping. This bag looks very sturdy. Wow, I love this. Best one I have seen yet. Looks like it will hold quite a bit too. I would use it for groceries. I love that this is collapsible, yet very sturdy! I would use this when I go grocery shopping. I hate all those plastic bags. But what I hate more is the annoying look that I get from the cashiers at Walmart for using reusable bags. If I win the grocer I will use it as an all purpose bag most likely.  I will use it when we shop, when we go out of town, and sometimes simply to carry my craft projects. I would use it every time I shop since it looks more durable than the other ones I have. 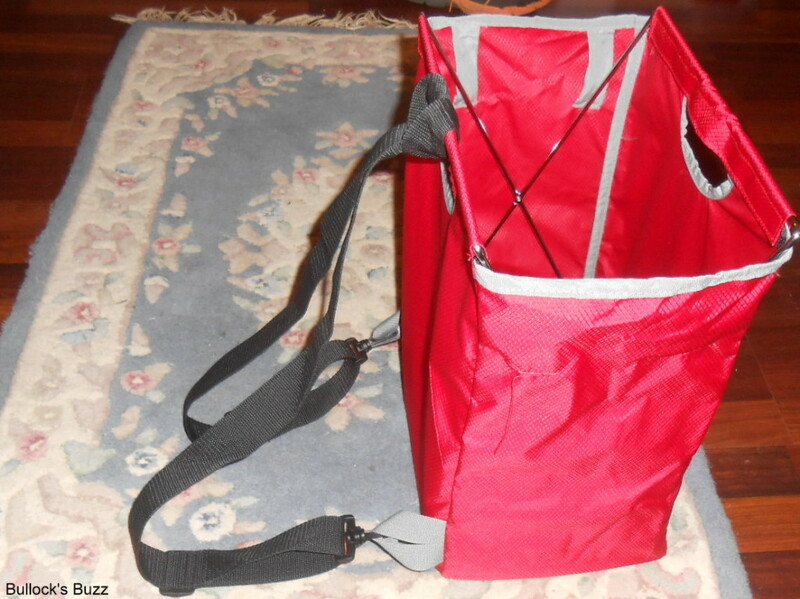 well,since it has a sturdy metal frame unlike other reusable bags I would use it for my trips to family dollar,library,yard sales.lots of uses for this.